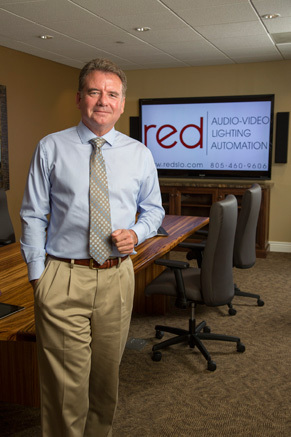 RED has an extensive background in commercial system and technology. We have done large training rooms and conference rooms for companies like IVAC Corporation and more. One of our favorite projects has been a conference room for Woodland-Leishman Associates in Orcutt. Their system allows them to connect up laptops or their server to display content on an 80″ LED TV, pictured here. We also designed custom branded digital signage for their waiting room. We have done systems for museums, performing arts centers, and more. Some people with simple needs just need a TV to display their computer on. Others need multiple sources, projection systems, sound reinforcement, sound masking, program recording, teleconferencing, and the like. Contact us for a personalized consultation to discuss your needs and goals. At that time, we can provide you with a general cost idea. Whatever your unique business needs, RED has a creative solution.